Muzaffarnagar, April 11: The voting for first phase of Lok Sabha elections began on Thursday. Voting is underway for 91 Parliamentary constituencies spread over 18 states and two union territories in the first phase. In Uttar Pradesh, voting for 8 seats is currently underway in the first phase. In the run up to Lok Sabha Elections 2019, the state is set to witness a three-way contest with SP-BSP combine against the BJP and the Congress. Uttar Pradesh Lok Sabha Elections 2019 Schedule: Constituency Wise Dates Of Voting And Results For UP General Elections. 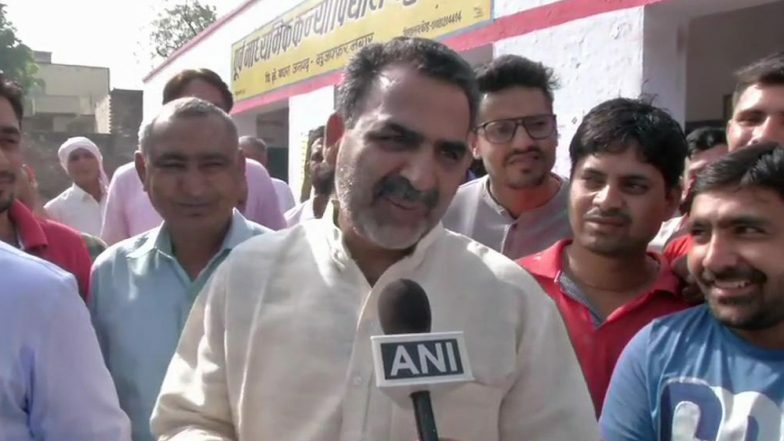 As people gathered in large numbers to cast their vote, Union Minister and Muzaffarnagar BJP candidate Dr Sanjiv Balyan made a controversial statement saying as faces of women in burkhas are not being checked, chances of fake voting are high. "Faces of women in burkhas are not being checked and I allege that fake voting is being done. If not looked into, I will demand a repoll", Balyan said. Lok Sabha Elections 2019 Schedule: Polls Will be Held in 6-7 Phases. The first phase polling in the state will be held on April 11, the second phase of UP for 8 seats will be held ob 18 April, third phase will be held for 10 seats on 23 April, phase 4 for 13 seats will be held on 29 April. The 5th phase will be held for 14 seats on 6 May, Phase 6 for 14 seats will be held on 12 May while the Phase 7 in the state for 13 seats will be held on 19 May. The counting of votes will be held on May 23 and results will be announced on the same day.